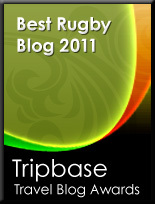 TOTAL FLANKER...a rugby blog: Shambles, what shambles? Some would say that there is an unjust disparity in some of the disciplinary verdicts being meted out at this RWC. Some would say that for Sean O'Brien to receive a one match ban for a blatant punch against France was way too lenient. Ditto Michael Hooper only getting a one match ban for a shoulder charge to the unprotected head of Mike Brown a couple of weeks ago. Compare that to the 3 match ban handed down to Ross Ford and Johnny Gray for a relatively innocuous looking tip tackle on Samoa's Jack Lam, and some might conclude that the disciplinary process is riddled with inconsistencies. Those that criticise, however, are not in full possession of the facts. For example it is a little known fact that that Hooper is very kind to animals while O'Brien has been known to help old ladies cross the road. Ford, on the other hand, was once mean to another boy at school while Gray hardly ever calls his mother. And as for Alessana Tuilagi, originally handed a 5 week ban for the offence of lifting his knee in the act of running, the disciplinary committee almost certainly took into account the fact that he gave the judicial officer "a funny look".